Intel started to dominate the CPU market with their Core 2 series and ever since they have kept on pushing. While the AMD Phenom and now Phenom II go a long way to improve the reputation of AMD processors, Intel still takes home the gold for most things. Recently, AMD launched their AM3 series of processors that use DDR3 and are still pin-compatible to the AM2 socket. This is a great move for AMD as it makes a much cheaper upgrade path than the Intel X58 chipset based motherboards that can cost up to $400. The X58 chipset is the backbone of the new Intel Core i7 (Nehalem) platform and this is a Quad-Core CPU that is made for enthusiasts. While there are some reports that gaming performance is sub-par, in our review of the "budget" Core i7 920 CPU, we'll take a good long look at performance and how it stacks up against the best from AMD - the Phenom II 940 Black Edition. I'm sure that you think you already know the winner, but there may be a few surprises. There has already been a ton of reviews and technology briefs regarding the Core i7 CPU technology so we're not going to beat a dead horse. Instead we'll recap of few of the features that set this CPU apart before we jump into testing, overclocking and generally pushing this CPU to the max. Intel's latest-generation microarchitecture first exemplified as the Intel® Core™ i7 processor represents the next step in unprecedented processor performance and dynamic scalability. Designed from the ground up to take advantage of hafnium-based Intel® 45nm hi-k metal gate silicon technology, Intel® Microarchitecture (Nehalem) unleashes parallel processing performance enabled by Intel® QuickPath technology providing an integrated memory controller and high-speed interconnect per independent processing core. Dynamic scalability, managed cores, threads, cache, interfaces, and power for energy-efficient performance on demand. Design and performance scalability for servers, workstations, notebooks and desktops with support for 2-8+ cores and up to 16+ threads with Intel® Hyper-Threading Technology (Intel® HT Technology), and scalable cache sizes, system interconnects, and integrated memory controllers. Intel® Turbo Boost Technology delivers additional performance automatically when needed by taking advantage of the processor's power and thermal headroom. This enables increased performance of both multi-threaded and single-threaded workloads. Intel Hyper-Threading Technology brings high-performance applications into mainstream computing with 1-16+ threads optimized for a new generation multi-core processor architecture. Scalable shared memory of Intel® QuickPath technology features memory distributed to each processor with integrated memory controllers and high-speed point-to-point interconnects to unleash the performance of future versions of next-generation Intel® multi-core processors. Multi-level shared cache improves performance and efficiency by reducing latency to frequently used data. There are several things that separate this processor from its predecessors and the competition. This is the first multi-core Intel CPU that also supports Hyper-Threading for each core. This gives 8 threads with which to process data simultaneously. The Core i7 also supports three channels of DDR3 memory that is controlled from a CPU-based memory controller. This eliminates FSB bottlenecks that traditionally hindered raw memory performance on previous Intel CPUs. Another feature worth noting is the "Turbo Boost" function which takes the processor up one multiplier for faster speeds in most applications. For example our 2.66GHz CPU (20*133) ran most of the benchmarks at 2.8GHz (21*133) as Turbo Boost ups the multiplier. There are many other benefits and improvements, but these are a few of what makes the Core i7 a faster, better processor. 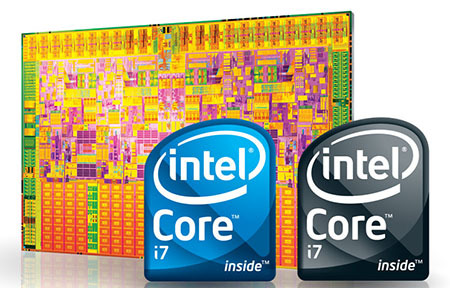 The Core i7 currently comes in three flavors - the i7-920 at 2.66GHz, i7-940 at 2.93GHz and the i7-965 Extreme Edition at 3.2GHz. The chart below shows how they compare. Before we drop the CPU in our system, we'll take a close look at the detailed specifications of the Core i7-920 on the next page.